Lately, I’ve been seeing lots of green beans at the farmers’ markets. They are “in season” this time of year—from summer to early fall. I absolutely love steaming and sautéing them in garlic, salt, and other spices. If you enjoy them as much as I do, you’ll be happy to hear about green beans nutrition. They are loaded with key nutrients like fiber, vitamin A, vitamin C, and vitamin K. As a result, green beans are beneficial for everything from preventing and fighting cancer, managing diabetes, protecting against heart disease, and more. This article is a guide for everything about green beans, including its history, health benefits, and how to use them. Green beans belong to the Phaseolus vulgaris classification of bean, which is a type of legume. The classification originates from the Fabaceae family. Although their scientific name is Phaseolus vulgaris, the exact name also refers to other types of beans, including pinto, kidney, white, and red. Green beans are also called snap beans or string beans. There are more than 130 types of green beans that are divided into two categories: pole and bush. The most common green bean you likely will see at the market is the French green bean or the haricot vert. It has a long, thin, and tender pod. The pods and beans are the edible part of green beans. With that said, they aren’t the only parts of a green bean plant. There are also flowers that can be purple, pink, or white, and green or purple leaves. Green beans originated in Peru around 7,000 years ago, and today they are produced throughout the world. The top producers include China, India, and Indonesia, while large amounts are also produced in the U.S. Besides having many health benefits, green beans also kill fungi responsible for many types of plant death. What are the key green bean nutrition facts? They contain high amounts of various proteins, carotenoids, and other antioxidants. Green beans are also high in fiber and important micronutrients. Specifically, they are an excellent source of vitamin A, vitamin C, vitamin K, folate, and manganese. Green beans also contain decent amounts of vitamin B1, vitamin B2, vitamin B3, vitamin B6, potassium, iron, and magnesium. There are also trace amounts of vitamin B5, calcium, zinc, copper, and selenium. The following is a comprehensive green bean nutrition chart with information for one cup of raw green beans or 110 grams (g) of the legume. What are the health benefits of green beans? For starters, the high vitamin K content in them can help you build and maintain strong bones. The fiber in green beans protects the gastrointestinal tract lining from damage, so it helps prevent various digestive issues. At the same time, green beans and legumes, in general, are a great source of nutrition for people at risk of infertility since they contain significant levels of both iron and folate. Green beans are known for anti-inflammatory, antimicrobial, neuroprotective, and antidiabetic properties. As a result, they have a part in preventing and fighting cancer, managing diabetes and related weight issues, protecting the heart from disease, and reducing the spread of HIV (human immunodeficiency virus). Let’s further examine their impressive health benefits. 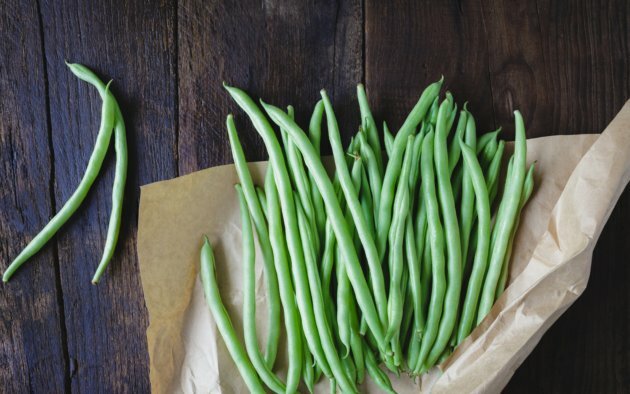 Research shows that green beans can prevent and stop the spread of various cancers. In part, this is due to the high antioxidant content in them. A study overview found that the anticarcinogenic activity of beans is associated with resistant starch, insoluble and soluble fiber, phenolic compounds, protease inhibitors, saponins, and phytic acid. Regular green bean consumption is associated with a reduced risk of colon, breast, and prostate cancer. And eating different varieties of Phaseolus vulgaris is linked with slowing or inhibiting the growth of breast cancer, leukemia, and lymphoma cells. Several nutrients in green greens contain cancer-fighting properties, including the antioxidant carotenoid called lutein, as well as vitamin C and vitamin K.
Green beans are considered low on the glycemic index. Low glycemic diets help regulate insulin sensitivity. As a result, they can help you manage diabetes, and are a welcomed addition to any diet plan for diabetes. Hypoglycemic foods like green beans have been found to reduce the glucose tolerance curve by almost five percent more than the most common drugs prescribed for diabetes. A study published in Plant Foods for Human Nutrition in 2013 found that when cooked beans are given to diabetic rats, there is a significant drop in blood sugar consistent with the protection of beta cells in the pancreas. Diabetics often have damaged beta cells in the pancreas, while these cells mean the body produces less insulin and fails to release insulin that is already in the body. Other research shows that beans in the Phaseolus vulgaris species can reduce inflammation associated with diabetes. Green beans can also help with weight loss when added to a balanced diet. It does so by reducing blood sugar levels and making you feel full by slowing the secretion of the hunger hormone called ghrelin. Legume consumption four or more times weekly can reduce heart disease risk up to 22% compared to eating them just once weekly, according to research published in the European Journal of Clinical Nutrition in 2006. Other studies show that eating three-quarters of a cup of beans daily can reduce the risk of heart attack by 38%. Green beans also contain vitamin K and lutein, which can protect the heart. Vitamin K prevents large calcium deposits from calcifying the arteries. Low lutein levels are linked with hardening of the artery walls, whereas high lutein in the blood reduces heart attack and coronary disease. A study published in Phytomedicine in 2010 examined the effect of a specific nutrient called hemagglutinin in French green beans on fungus, tumors, and HIV. Green beans had a positive effect on all three, but the most interesting effect was how they inhibited HIV. French green beans significantly inhibited reverse transcription in HIV-1 cells, which is the most common HIV found worldwide. The study suggests that green beans, along with antiretroviral therapy and other HIV-fighting foods like spirulina, can be part of a long-term treatment solution for HIV patients. When left untreated, HIV can develop into AIDS (acquired immunodeficiency syndrome). The local farmers’ market is the best place to find organic green beans. Look for beans with a vibrant green color and a smooth texture. Your beans should be free from brown spots or bruising. Good green beans will be firm and make a snapping sound when you open them. Unwashed and fresh beans will keep in your refrigerator in a plastic bag for around a week. You can also maintain nutritional value from freezing green beans for up to six months. A good approach is steaming fresh beans and allowing them to cool and dry before freezing them. As an alternative, you can also buy frozen green beans if purchasing fresh isn’t an option. There are many ways to cook with green beans. But before cooking them, run them under cold water and cut off the ends. Steaming green beans is the most common preparation method. After steaming, I also like to sauté them in ghee and garlic. Check out my simple recipe below. Steam prepared beans for eight to 10 minutes, or until soft. Melt ghee and sauté garlic cloves. Then add steamed beans and spices. Sauté until everything combines well together. There are many health benefits of green beans, but are there any side effects to consider? Well, they do contain oxalic acid, which can crystallize and lead to stones in the urinary tract. So, it is best to drink lots of water to help decrease your risk of stones. People with conditions that cause mineral deficiency may want to limit their green bean intake. The reason is the small amount of phytic acid in them. Cooking green beans or avoiding them raw can also decrease the amount of phytic acid you retain. Some people may also be allergic to legumes such as green beans. Stop eating them immediately and consult a doctor if you suspect you are allergic or sensitive to them. Green beans are an excellent source of fiber, vitamin A, vitamin C, vitamin K, and manganese. The antioxidants in green beans help fight diseases such as cancer, diabetes, HIV, and heart disease. Fresh and organic green beans are best “in season” at farmers’ markets from summer to early fall. Green beans are most commonly steamed, but you can also sauté them in garlic, ghee or butter, and other spices. “Beans, snap, green, raw Nutrition Facts & Calories,” SELF NutritionData; http://nutritiondata.self.com/facts/vegetables-and-vegetable-products/2341/2, last accessed August 23, 2017. Ware, M., “Green beans: Health benefits, uses, and possible risks,” Medical News Today, May 16, 2017; http://www.medicalnewstoday.com/articles/285753.php, last accessed August 23, 2017. “What Are Green Beans Good For?” Mercola; http://foodfacts.mercola.com/green-beans.html, last accessed August 23, 2017. Lam, S.K., et al., “Isolation and characterization of a French bean hemagglutinin with antitumor, antifungal, and anti-HIV-1 reverse transcriptase activities and an exceptionally high yield,” Phytomedicine, May 2010; 17(6): 457-462. DOI: 10.1016/j.phymed.2009.07.017. Roman-Ramos, R., et al., “Anti-hyperglycemic effect of some edible plants,” Journal of Ethnopharmacology, August 11, 1995; 48(1): 25-32. https://www.ncbi.nlm.nih.gov/pubmed/8569244. Hernandez-Saavedra, D., et al., “Cooked common beans (Phaseolus vulgaris) protect against beta-cell damage in streptozotocin-induced diabetic rats,” Plant Foods for Human Nutrition, June 2013; 68(2): 207-212. DOI: 10.1007/s11130-013-0353-1. Lomas-Soria, C., et al., “Cooked common beans (Phaseolus vulgaris L.) modulate renal genes in streptozotocin-induced diabetic rats,” The Journal of Nutritional Biochemistry, July 2015; 26(7): 761-768.DOI: 10.1016/j.nutbio.2015.02.006. Flight, I., et al., “Cereal grains and legumes in the prevention of coronary heart disease and stroke: a review of the literature,” European Journal of Clinical Nutrition, October 2006; 60(10): 1145-1159. https://www.ncbi.nlm.nih.gov/pubmed/16670693. Hayat, I., et al., “Nutritional and Health Perspectives of Beans (Phaseolus vulgaris L.): An Overview,” Critical Reviews in Food Science and Nutrition, January 14, 2013: 580592. DOI: 10.1080/10408398.2011.596639. Lanza, E., et al., “High Dry Bean Intake and Reduced Risk of Advanced Colorectal Adenoma Recurrence among Participants in the Polyp Prevention Trial,” The Journal of Nutrition, July 2006; 136(7): 1896-1903; http://jn.nutrition.org/content/136/7/1896.short.